By popular demand and because the team promised, you can now get hold of all the entries to the 2010 Wrecks Factor competition. 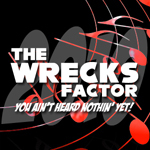 The Wrecks Factor 2010 album contains 23 tracks including several bonus and alternate versions. Some are good, some are bad, a couple are surprisingly amazing. Those people who have entered WF10 will now have their entries evaluated by this year’s three judges – Vger, DiGi Valentine and T-Bird. You can find the album listed in the Depository Music page’s “Sonic Wrecks Tiles” section, or you can head straight to it here. Any favourites? Let us know in the comments! ‘After That Emerald’ is an exact copy of the speshul stage music on Sonic Heroes. It is a favorite of mine. hang on where is dreadnux and raoreye blacks songs?! I liked ‘The Running Joke’ best. My brother liked ‘I Am (The E.G.G.M.A.N. )’ best. Will likely be next Sunday when we first start broadcasting them. Oh, I see. I was worried ’cause I missed last Sunday’s show. Oh crud, I must’ve sent in the sped up version of my entry now I sound auto-tuned. 😛 That’ll teach me to give three files the same name. Derp.